Finally get to blog about night market food! Somehow my camera is always forgotten or out of battery everytime we go, even though I have been going a lot less than I did when I was younger- I loved to go to Shih Lin night market (but that's another entry!). Keelung is about a half hour away from Taipei. Their night market is pretty famous- there are usually so many a lot of people there! There's two long rows of food stands where you can sit at the counter and order your food- there's a lot to choose from. Some people are scared of eating foods from stands or from street vendors, but luckily I've never had any problems with it.. In general, I think you just stick to ones that are busy or look clean- and with the Keelung Night Market having such high traffic- it means their turnaround rate is high enough that nothing is ever really sitting around. While all the stand number/names have brief English descriptions here, ordering is most likely a point and nodding experience if you don't speak Chinese. Wander around from stand to stand until you see something that you like and see if there's a seat available. 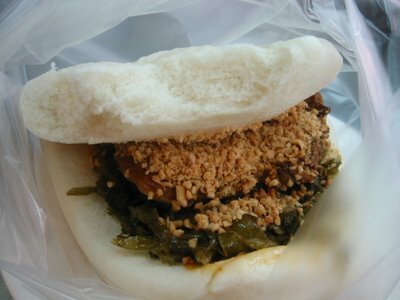 One of my favorites is the gua bao (NT$30), which is like a sandwich made with a soft steamed bun with tender pork, ground peanuts and pickled vegetables inside- I suppose you could compare it as a chinese carnitas soft taco if you really had to make the reference. I also like the chinese spring/summer roll- which is made with a thin crepe-like skin wrapped around cabbage, ground peanuts, soybeans and carrots. 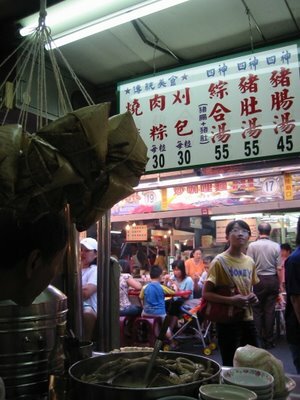 A lot of what you like is probably personal taste- if you are adventurous, you can try the soup with intestines or the boiled various intestines at the stands. This soup has a tiny bit of chinese herb taste to it, which makes it taste "good for you" without being overly pungent. Paired with freshly fried fishcake or "tem-pu-la," it's a sweet and spicy match to the plainer notes of the broth. There are also a few fresh juice and shaved ice stands. If you get a chance, you can come with an empty stomach and sample and hop around until you are full! With everything being around NT$25-100 (less than US$1-3), you could easily snack all day! Killer post. I miss the night markets the most. There's really nothing like Taiwanese street hawker food. Having been to Keelung twice, once in 2005 and earlier this month, I can attest to how great and marvelous this place is. 1) Ding Bien Tsuo (http://100wu.com.tw/) adjacent to the temple. Over 100 years of history, as old as the temple itself. Taipei 101 food court has a branch but eat this at Keelung first. 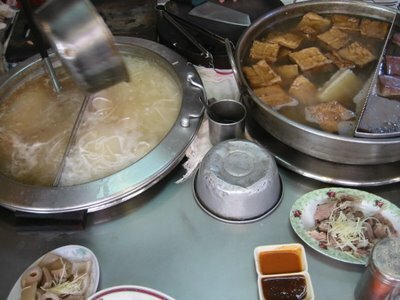 2) Very close by to the above stall is a place that specializes in stewed minced pork belly over rice (lou rou fan), and some side dishes that include bamboo shoot, yutofu. I want to say it is stall #31. Very very very very good. 4) Keelung signature sandwich. That's all this vendor sells. Bread is deep fried dough with batter, lots of mayo, tomatoes, Taiwanese sliced sausage, marinated egg, cucumbers. Weird mix but is quite tasty. A local favorite, and you have to take a number! 5) Off the main strip is a famous tofu fa place called 3 Brothers (Sam Shung Dee). If you like Little South Gate, give this original location a try. 6) There are two vendors that specialize in pig feet. One is on the main strip that does a roasted (hung shao) version, the other has a sit down restaurant that does a clear soup version. Both are superb. 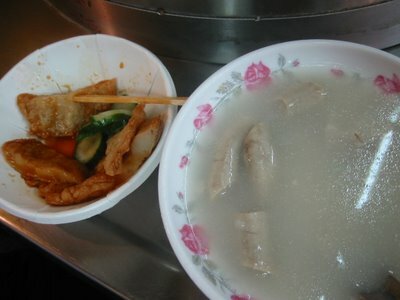 One of the soups they offer has the tendon of the pig feet in it, that's a must try. 7) Sashimi at Keelung is actually not bad. 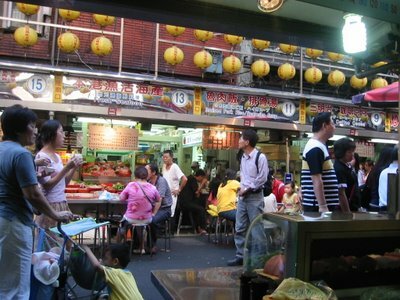 If you're a raw fish lover, Keelung has its own fishing port and access to very fresh and multiple varieties of fish. Unfortunately you won't see the exotic stuff as sashimi, mostly common but locally sourced fare like tuna, salmon. There are some white fleshed themed fish that are local that they might do as sashimi. I never thought this would be worth trying, but I do recommend it if you have the stomach space. Not sure about sushi because the vendors are likely not classically trained in Japan. 8) There's a vendor that sells mini Taiwanese grilled sausages at NT$5 each, and basically you take a bite of that and then a bite of raw garlic together for the best experience. Superb stuff. There's more really :-) but that's all for now. i love night market food so much. i finally tried gua bao for the first time tonight and it is SO SO SO GOOD!!! i want another one. chubbypanda: i know- there's nothing like it in LA/OC for sure. ffc: for the first time ever?? ?